WMCCAI provides the most direct line of marketing to reach community association homeowners, managers, and a variety of community association professionals. 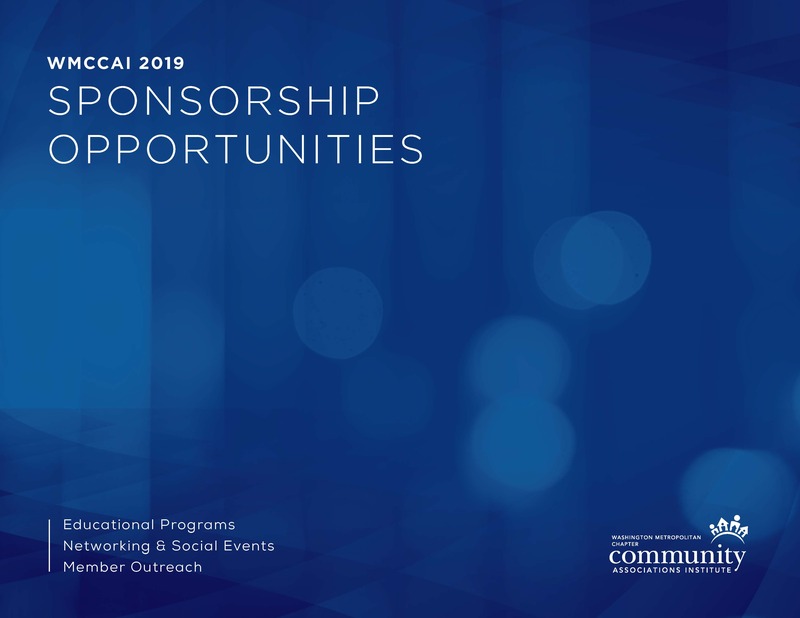 In an effort to assist you with your marketing plan, and to help you better reach community association managers and residents, we have created brochures targeted to your interests with detailed descriptions of advertising and sponsorship opportunities available to you through WMCCAI. WMCCAI’s Partner Program is an all-inclusive marketing program designed to showcase your company across all the Chapter’s programs. 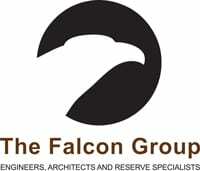 Partners are guaranteed continued exposure throughout the year. Partners receive exclusive benefits including credits to use on advertisements, event registrations…even your exhibit booth. Many benefits are unavailable outside of the Partner Program. Chapter Partners receive unparalleled marketing advantages including enhanced advertising placements and special recognition throughout the chapter. At the highest level, this one program alone will get your company’s name/logo and link on more than 96,000 chapter e-mails to members and key pages of the chapter’s website, not to mention your company’s name/logo printed on the back of more than 40,000 copies of Quorum. Your company will be included on signage at every event, listed in printed marketing materials developed by WMCCAI, and given repeated recognition throughout the year in print and electronic channels. Chapter Partners also receive first access to exclusive advertising and sponsorship opportunities and Partner Dollars to spend on event registrations, exhibits, and more. WMCCAI offers multiple advertising opportunities. 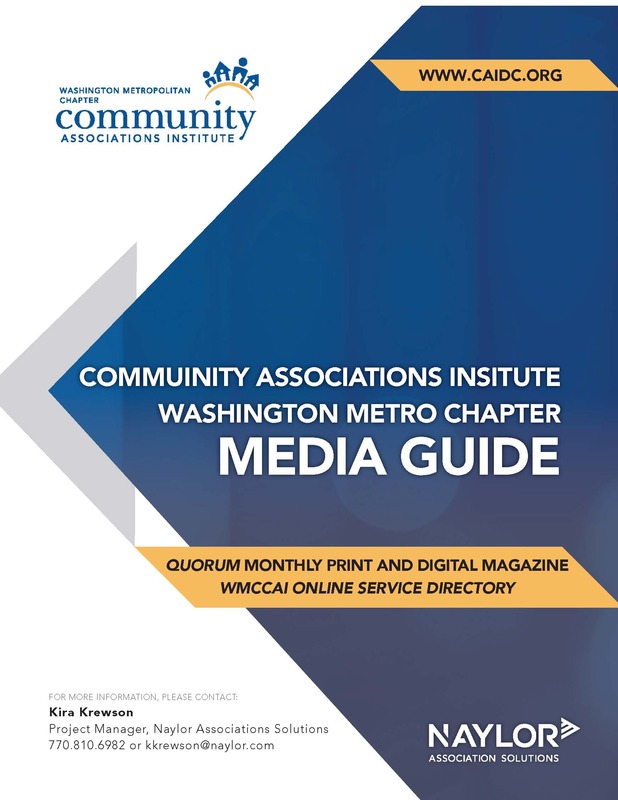 Targeted advertising in Washington Metropolitan Chapter Community Associations Institute’s monthly magazine, Quorum, opens the door to thousands of prospective customers and contacts in the community association industry. The appearance of your advertisement in this full-color, 40-page, glossy magazine is a direct line to community managers, community association residents, and other community association professionals. Quorum is mailed to all WMCCAI members and made available on our website, where specific pages, articles, and ads may be shared via social media. At least 3,200 core contacts, consisting primarily of community association residents, community managers, and board members receive the magazine each month. Quorum magazine offers both display and classified advertising options to member and nonmember companies. Display ads are placed throughout the magazine while classified listings fall near the back and are categorized by services provided, (e.g., Management Services, Window Cleaning, Attorney, Asphalt/Concrete Paving, Reserve Studies, etc.). Display ad sizes range from a 1/6 page to a full page. Premium ads are those appearing on the inside front cover and the inside and outside of the back cover. Premium ads provide great exposure and are just $150 more than regular display ads. View the 2019 Advertising Media Kit for all details and pricing. Advertising opportunities are available for the 2018 WMCCAI Resource Guide. Last year, over 2,000 conference attendees received the Resource Guide, which includes exhibitor listings, general conference info, and Washington Metropolitan Chapter Community Associations Institute information. The Resource Guide offers premium ad spots on tabbed pages that will identify the various sections (e.g., educations, exhibitors, chapter information, etc.). The entire guide is printed in full color and every attendee receives one. The guide is a great resource attendees refer to throughout the year to find service providers. Washington Metropolitan Chapter Community Associations Institute works with Naylor, LLC to provide our Online Service Directory. Naylor provides advertising and communication services that build your company’s image and link your brand with buyers in the community association industry. This is your opportunity to advertise and promote your products and services to a major purchasing audience in Maryland, Virginia and Washington, D.C. If you are seeking local talent in the community association industry, you’ve come to the right place. List your job opening with WMCCAI and find your next superstar employee. Job listings will appear on the Chapter website in the Job Bank section and for a premium, you can also have your listing placed in Quorum magazine, which reaches approximately 3,200 industry professionals. 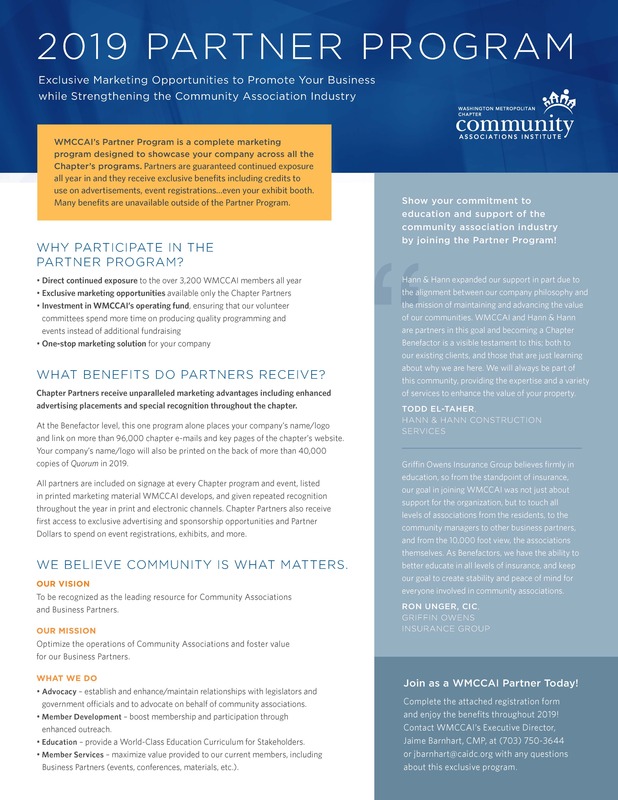 No organization is better equipped to connect you with the region’s vast community association industry than Washington Metropolitan Chapter Community Associations Institute (WMCCAI). Community Associations Institute estimates that in 1970 there were 10,000 community associations representing 2.1 million residents nationwide. Today, nearly 328,500 association-governed communities house more than 65.7 million Americans; Maryland, Virginia, and Washington, D.C., account for approximately 16,600 associations combined. All dates are tentative; please see www.caidc.org for the most up to date event calendar. • Acknowledgment on event webpage and event marketing campaign(s) (as applicable).